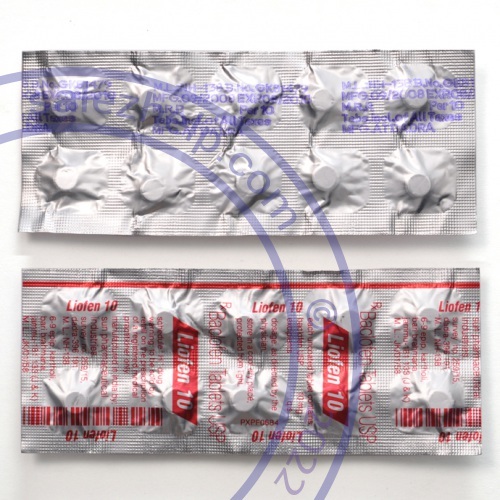 Manufacturer: Samarth Pharma Pvt.Ltd / Sun Pharmaceutical Industries Ltd.
Generic Lioresal is used to treat and relieve spasms and cramping of muscles due to a variety of causes, including multiple sclerosis or brain or spinal cord injuries. 10mg × 30 tablet $ 1.00 $ 29.95 Buy Now! 10mg × 60 tablet $ 0.93 $ 55.95 Buy Now! 10mg × 90 tablet $ 0.87 $ 77.95 Buy Now! 10mg × 120 tablet $ 0.82 $ 98.95 Buy Now! 10mg × 180 tablet $ 0.77 $ 137.95 Buy Now! 10mg × 360 tablet $ 0.72 $ 257.95 Buy Now! 25mg × 30 tablet $ 3.33 $ 99.95 Buy Now! 25mg × 60 tablet $ 3.30 $ 197.95 Buy Now! 25mg × 90 tablet $ 3.10 $ 278.95 Buy Now! 25mg × 120 tablet $ 2.93 $ 351.95 Buy Now! 25mg × 180 tablet $ 2.77 $ 497.95 Buy Now! BACLOFEN helps relieve spasms and cramping of muscles. It may be used to treat symptoms of multiple sclerosis or spinal cord injury. Take this medicine by mouth. Swallow it with a drink of water. Do not take more medicine than you are told to take. Do not suddenly stop taking your medicine. If you do, you may develop a severe reaction. If your doctor wants you to stop the medicine, the dose will be slowly lowered over time to avoid any side effects. Follow the advice of your doctor. Baclofen can affect blood sugar levels. If you have diabetes, talk with your doctor or health care professional before you take the medicine. You may get drowsy or dizzy when you first start taking the medicine or change doses. Do not drive, use machinery, or do anything that may be dangerous until you know how the medicine affects you. Stand or sit up slowly.